WonderCore’s durable steel construction can support up to 265 lbs (120 kg). If you’re looking to tone, tighten and strengthen your core then the Wondercore 2 is the machine for you. This innovative ab-blasting machine will work your core like never before and help you build the body of your dreams. One of the main selling points of the Wondercore 2 is versatility. If versatility is something that excites you, the WonderCore 2 is built for you. This twelve in one machine has an endless range of possible exercise routines ranging from standard sit-ups to sideways crunches and rowing/arm exercise routines. Plus, the built in rower resistance bands of the Wondercore 2 allow you to get a total body workout, targeting your upper, middle and lower abs, obliques, chest, shoulders, back, traps, biceps, triceps, glutes and calves. 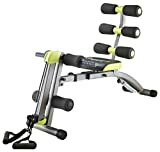 The Wondercore 2 also has the ability to go beyond 180 degrees for a tougher workout and the built in seat twists 90 degrees in each direction to free the body and adapt the workout even further. It engages the full range of motions. The incredible dual-resistance design ensures your muscles are engaged throughout the entire motion, both on the way down and back up for maximum results. What’s more, you can adjust the resistance to your liking, making the Wondercore 2 a great platform for both beginners and advanced users. This machine is built to last. The durable, gym quality, steel construction boasts an improved ergonomic back design, can support up to 265 lbs (120 kg) and also has the ability to cater to a greater range of user heights. To get you started on your journey, you will receive a complimentary 30 minute workout routine DVD led by fitness experts Jordan Nevels and Ms Bikini Universe Jessica Starr. On top of the DVD routines, you will also receive a complimentary exercise guide and nutrition guide with 7-day meal plan. All of these add-on features really make this an excellent value package for anyone who can benefit from some extra help planning for their new flat stomach or rippling abs.